"Throughout history, war has never paused for preparation..."
Feudal Japan is one of the more fascinating eras in history. The time period featured a heady mix of brutal wars underscored by an almost zealot-like devotion to honor among the Samurai. 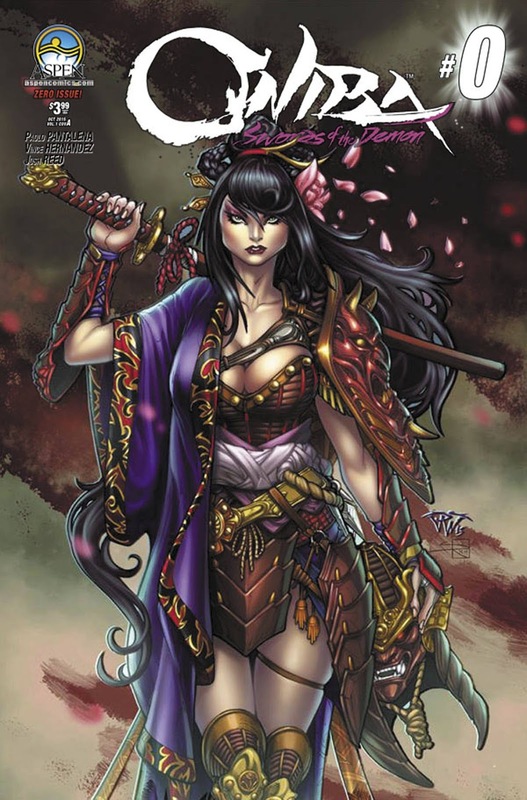 Aspen Comics chose that setting as the backdrop for their latest new comic in Oniba: Swords of the Demon #0. The issue is written by Vince Hernandez, illustrated by Paolo Pantalena, colored by Hi-Fi and lettered by Josh Reed. When the actions of her feudal lord begin to lay the seeds of doubt within her, Yukiko, a samurai with exceptional swordplay and even far greater courage, must make a bold decision that forever changes her fate-along with the history of Japan itself! Oniba: Swords of the Demon #0 plays out like a zero issue should, as it introduces the reader to Yukiko, a samurai forced to contend with difficult choices. Hernandez and Pantalena do a pretty good job of her setting her and her situation up, even if it does feel a little hurried at times. The issue sets the stage for a Japan amidst turmoil, as there are factions seeking to obtain the means to rule the country. One of those men is Yukiko's sensei, with Hernandez and Pantalena characterizing him as a pretty monstrous villain of sorts whose actions serve as the catalyst for Yukiko's new path. Yukiko is presented as more than combat-capable and she exhibits subservient qualities found in a master/apprentice relationship. The characters in Oniba: Swords of the Demon #0 are illustrated by Pantalena with very crisp, clean lines that stand out from the rest of the art. All of the characters boast looks that fit perfectly within the feudal Japan setting fostering the book's events. Pantalena finishes the artwork with a brushed look that gives the artwork a watercolor resemblance at times and further accentuates the emotion in the characters. There are an abundance of panel insets and overlays throughout that keep the pacing feeling frenetic, with some of the panels even sporting various colored borders. The colors by Hi-Fi are largely red and purples, all of which accent Yukiko's armor very well. Oniba: Swords of the Demon #0 is a very promising zero issue that is ambitiously planning for down the road. Yukiko is an honorable warrior forced to contend with events that thrust her moral compass into complete disarray. The script by Hernandez is straightforward and paced well, effectively putting the characters through situations that don't feel forced. Pantalena's artwork is very precise and he does a great job of capturing the intensity of war in feudal Japan. 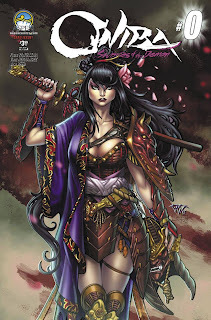 Oniba: Swords of the Demon #0 is a great start that offers yet another strong, female character in the Aspen Comics universe. Oniba: Swords of the Demon #0 is in stores October 28.